With about 17 billion domestic animals in the world, with most of them raised on small mixed crop-and-livestock farms in developing countries, livestock production is a major part of global agricultural production. But the sector requires large amounts of feed and water and domestic animals generate significant amounts of greenhouse gases such as methane, which are causing global warming. One way to make livestock production more efficient is through ‘sustainable intensification’ brought about by farm activities that help close yield gaps while also reducing the level of greenhouse gas emissions per unit of milk or meat produced. That was the topic of a recent ‘livestock live talk’ at the Nairobi headquarters of the International Livestock Research Institute (ILRI) given by agricultural systems analyst Mario Herrero. 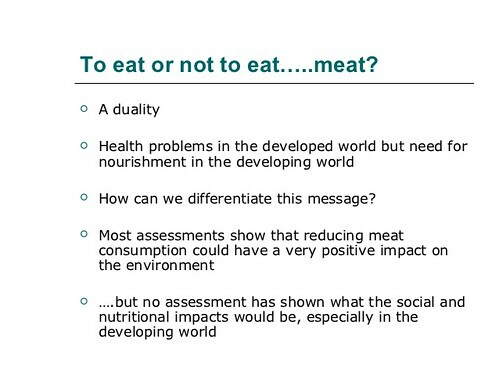 In rich countries and communities, Herrero added, reducing the amount of meat consumed could help lower demand for animal products while also reducing obesity and health problems associated with overconsumption of meat. Herrero said the ‘best options’ for making livestock production more efficient will vary considerably depending on the world’s vastly different livestock production systems and regions. What will work in dryland agro-pastoral systems of West Africa, for example, will differ vastly from what will increase efficiencies in pig rearing in southwestern China. 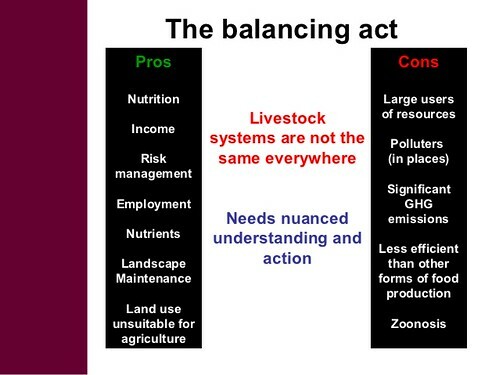 What this will take, Herrero said, is ‘a balancing act’ to deal with both the opportunities and challenges in livestock production systems. ‘Livestock systems are not the same everywhere; we need to understand the benefits and costs of the different systems and how these relate to the pressures of climate change and rising global food demand,’ he said. Investing not only in high-potential agricultural areas but also in the more extensive mixed crop-and-livestock systems of poor countries, which have been neglected till now and where production levels could be greatly increased. Increasing milk production by finding ways for poor dairy producers to obtain higher-quality year-round livestock feeds. Providing ways for small-scale farmers to ‘intensify’ their mixed farming and become more market oriented. In future, Herrero said, research needs to help resolve issues such as how best to use rangelands, where and when to invest in commercial large-scale livestock production systems and in smallholder systems, and how to harness biotechnology to help make small-scale livestock production more efficient. Herrero is a senior agro-ecological systems analyst with more than 15 years experience working on livestock, livelihoods and the environment interactions in Africa, Latin America and Asia. At this seminar, which also marked his farewell presentation at ILRI, Herrero looked back at his 13 years work at ILRI and reflected on ways of making the global livestock sector sustainable in the face of global change. Written by Jane Gitau, Nancy Moss and Paul Karaimu. This entry was posted in Agriculture, Climate Change, CRP7, PA and tagged ILRI, Kenya, livestock live talks, livetalks, Mario Herrero by Nancy Moss. Bookmark the permalink.